What main qualities have the 3 Michelin stars decorated chefs, how profitable has become this rating system in the golden age of culinary art and how does a well ranked kitchen look like? Leaders of the cooking industry give their answers in a series of tasty interviews in Michelin Stars - Tales from the Kitchen, directed by Rasmus Dinesen. 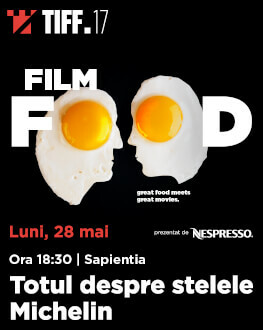 The screening will be followed by a special dinner prepared by chef Paul Oppenkamp owner of The Artist, one of the best fine dinining restaurants in Europe. Known for his modern approach in cooking, the Dutch chef combines classic techniques with the present-time’s cuisine and Romanian influences, giving birth to new amazing textures and flavors that revolutionize the culinary experience.